We’re sure that you’ve all heard of some pretty wild friendship stories between animals, but we can bet you’ve never heard one as crazy as this one. Lions are the kings of the animal kingdom as they’re vicious hunters that stalk their prey – no matter what size. 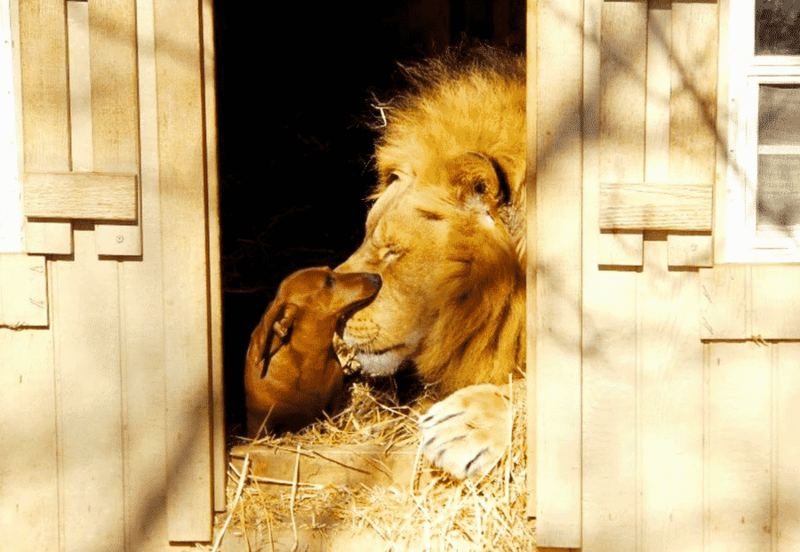 So when this huge lion became friends with a couple of dogs, everyone at the zoo was pretty stunned. You’ll drop your jaw at #13! Lions are growling and ferocious animals that rule and defend their territory. 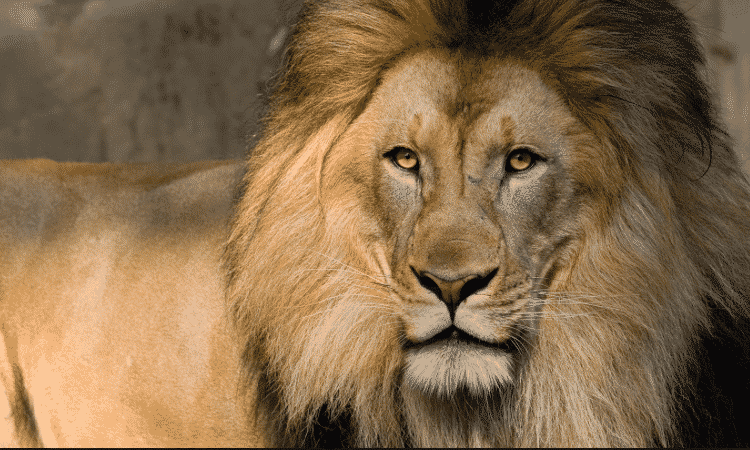 Weighing in at a few hundred pounds or more, the lion is one animal that no one wants to mess with or be left alone with. After all, we all know how that would end up. 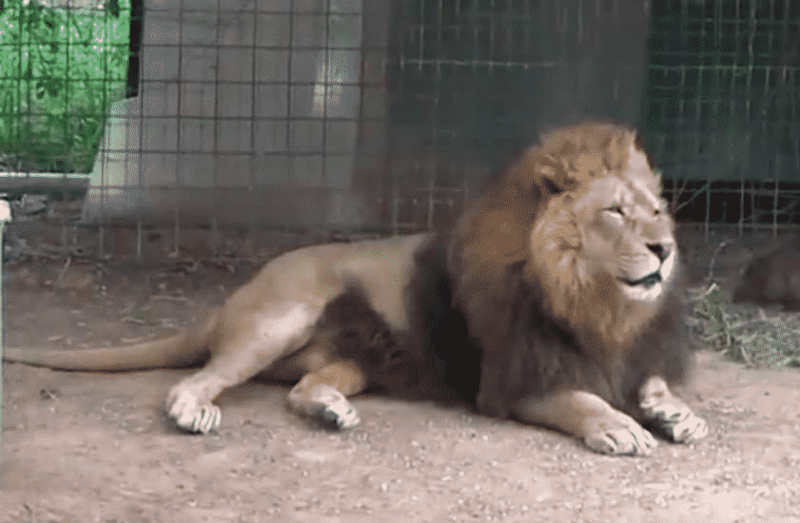 Meet Bonedigger, a rescued lion that lives at the Greater Wynnewood Animal Park in Oklahoma. With a name as terrifying as Bonedigger, one would expect that this lion would be a ferocious beast but that couldn’t be farther from the reality. So what makes Bonedigger so special? Sometimes it’s best not to judge a book by its cover or in this case, its size. 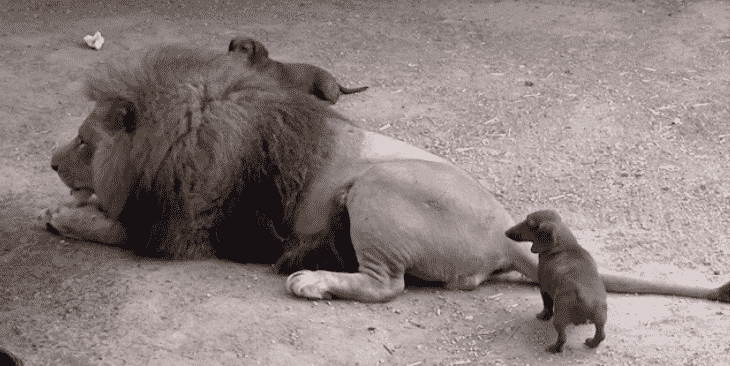 Here’s a funny story of how one gigantic lion became friends with the most unexpected animal. You won’t believe just how close-knit this friendship is! You see, Bonedigger was born with a metabolic bone disease. The disease left him slightly crippled, unable to take on the role of a fierce predator. Due to this, Bonedigger began to strike up an unusual bond with the zookeeper and other small animals from the zoo. When Bonedigger was just a cub, Milo and three other Dachshunds, Angel, Abby and Bullet, noticed that the cub had a disability. They immediately wanted to comfort him and stay by his side. 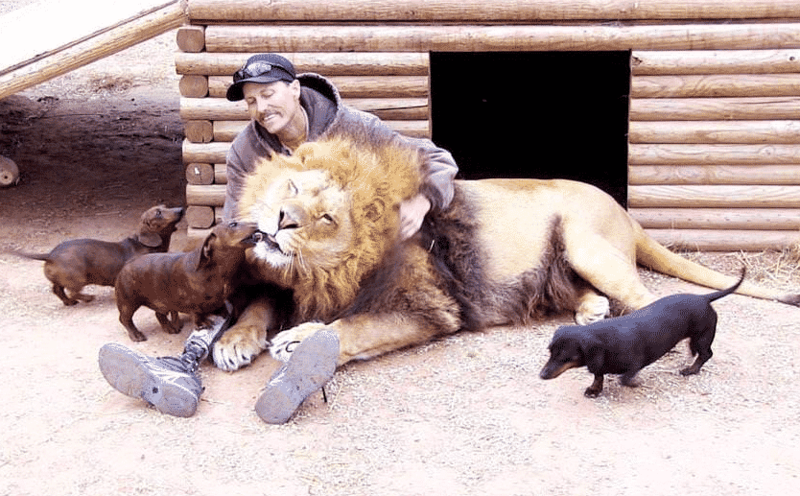 The dogs wanted to be his protectors, but no one knew how the lion would react. After all, they are hunters. But what happened soon after surprised everyone! 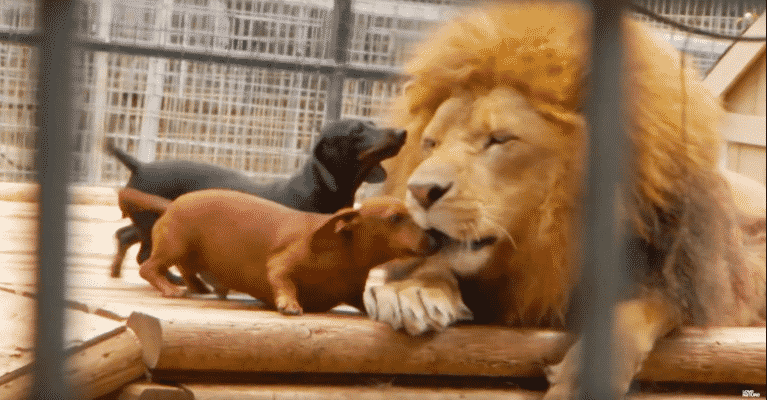 So the Dachshunds were brought into the cage and allowed to hang out with Bonedigger. So did the cub eat them alive? Swallow them whole? Tear them to bits? Nope, they surprisingly got along really really well. 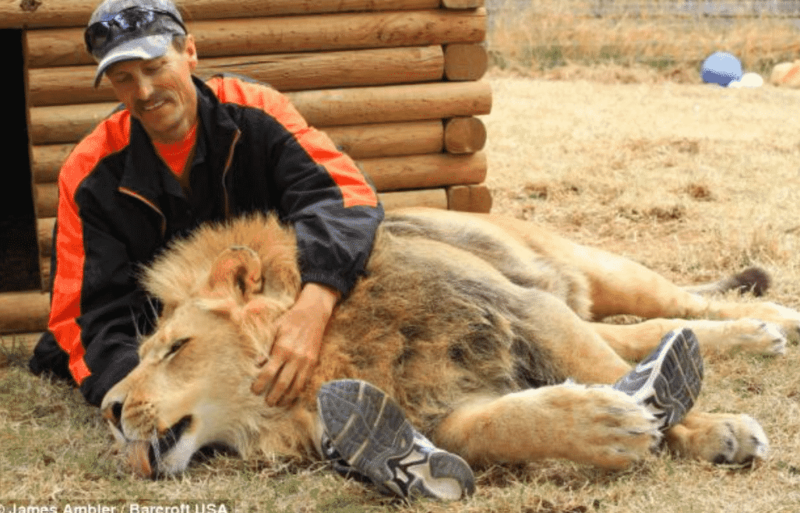 So what are the living conditions between the lions and his puppy pals now? 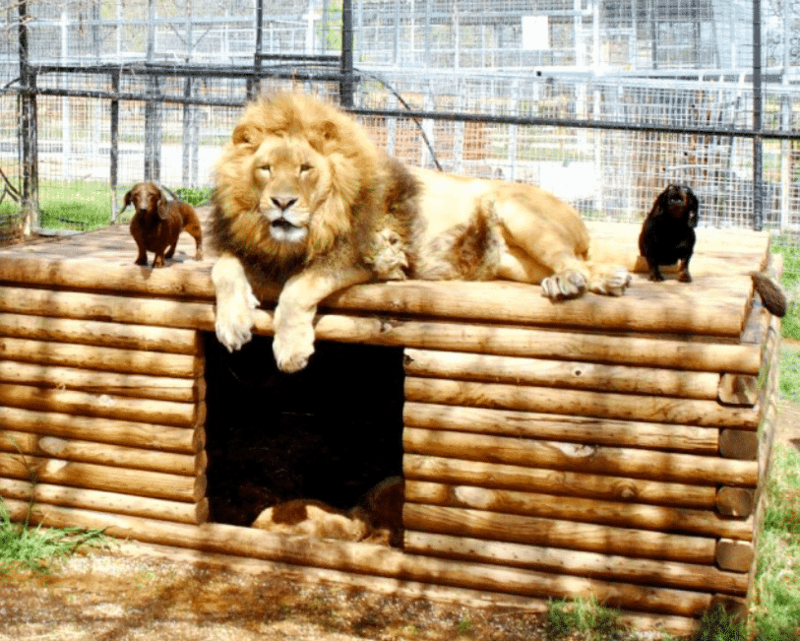 These days, the Dachshunds and 500lb Bonedigger are living the roommate lifestyle in the animal park cage. Sounds kind of like an episode of Friends, doesn’t it? 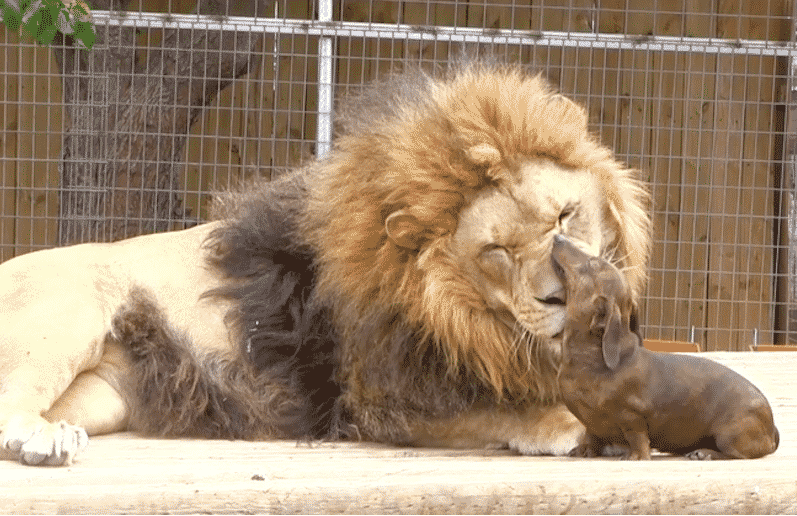 You’ll fawn over just how attached Bonedigger is to one of the wieners. Eight-year-old Milo and enormous Bonedigger have grown attached at the hip and you can often catch these two hanging out together and giving each other kisses. Check out some of the cutest moments caught on camera! 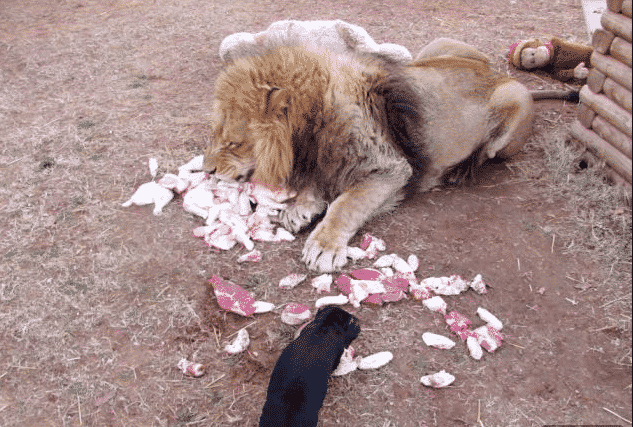 Take a look at Bonedigger sharing his dinner of raw meat with the dogs. Have you ever seen a happier family meal? The lion happens to treat the dogs like they were his own cubs and you’ll fall in love with some of their other family activities. They even groom each other, as you’re about to see in the following pictures! 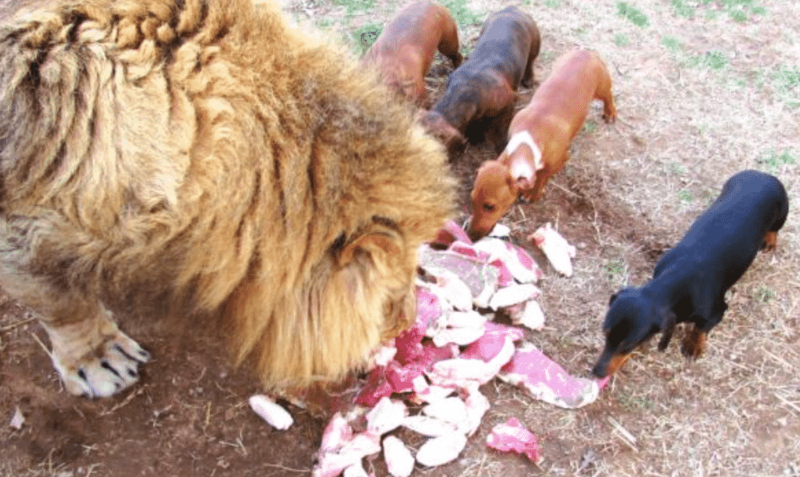 Since Bonedigger sees the Dachshunds as his own offsprings, he takes care of them in the same way. Bonedigger often goes out of his way to remove any fleas that he sees on their coats and often grooms them. But he’s not the only one that is infatuated with his roommates. Take a look at Milo’s funny behavior! They often say that imitation is the sincerest form of flattery and it seems that Milo has been following in that saying! “Milo does his best to copy Bonedigger when the lion tries puffing to communicate with other lions in the park,” says Mr. Reinke. The duo really does have a special love for one another. Check out how Milo helps keep Bonedigger’s smile sparkly clean! You wouldn’t expect that Bonedigger would be the only one taking care of everyone’s hygiene. Milo certainly appreciates the flea removal so he returns the favor by helping to clean the lion’s teeth! 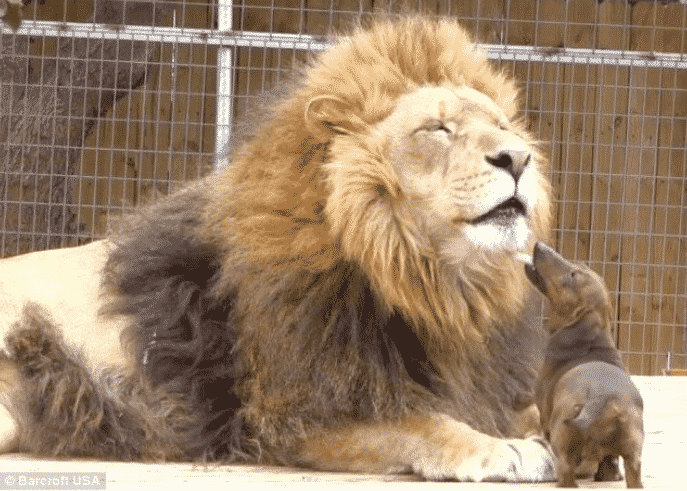 The friendship between the lion and the dogs is so inspiring that it’s left us all reevaluating our own friendships. So how does Reinke feel about all of this? Reinke had hand-reared Bonedigger since he was a just a cub at the animal park. Reinke realized he had animal whisperer skills after his accident. “Bondigger’s like a dog and when he hasn’t seen me for ages he gets all excited and runs up to me,” Reinke happily said. Reinke never expected that such an unlikely friendship would occur. When he was bottle-feeding Bonedigger as a baby he never thought something so miraculous would occur and that he would be alive to witness it. Bonedigger, in fact, helped save Reinke’s life. 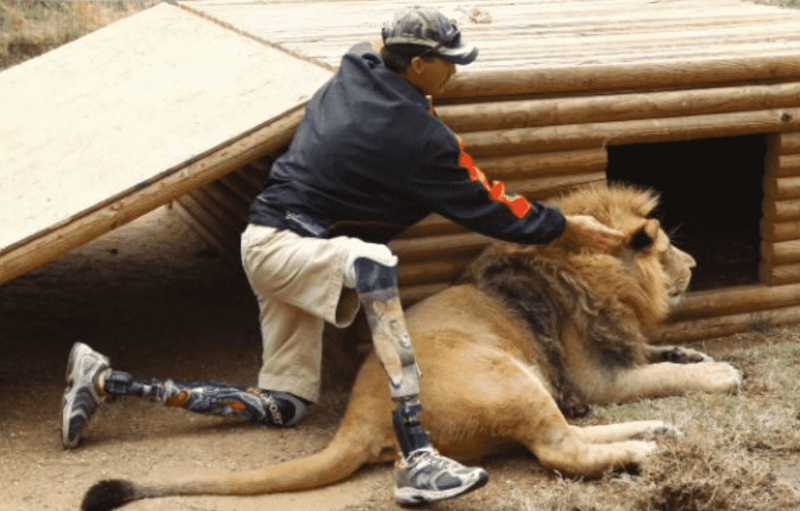 While living on the wild side of life, Reinke injured his legs so badly from a bungee fall that they had to eventually be amputated. 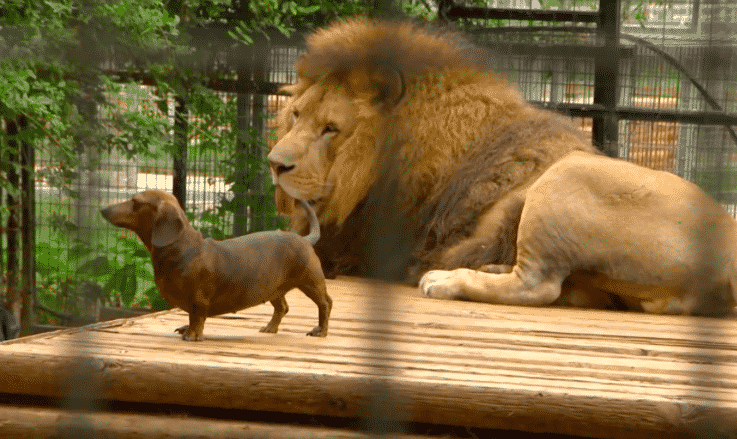 “This friendship between an 11-pound wiener dog and a 500-pound lion is the only of it’s kind in the world ever seen,” Reinke stated. He feels proud to have raised Bonedigger and these days he’s the only other person that is allowed to go inside the cage. Bonedigger is very territorial and protective of him and his family of pups. So, were we right? 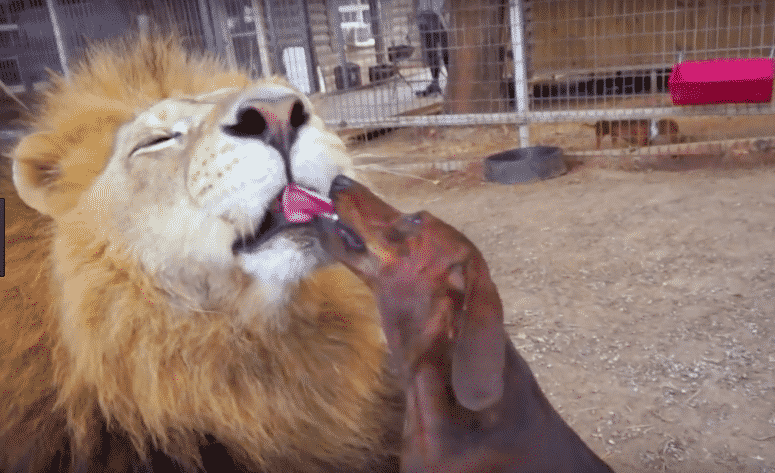 Have you ever heard of an animal friendship quite like this one? This one definitely takes the cake and it is so heartwarming to see such a beautiful and caring friendships between unlikely animals occur.